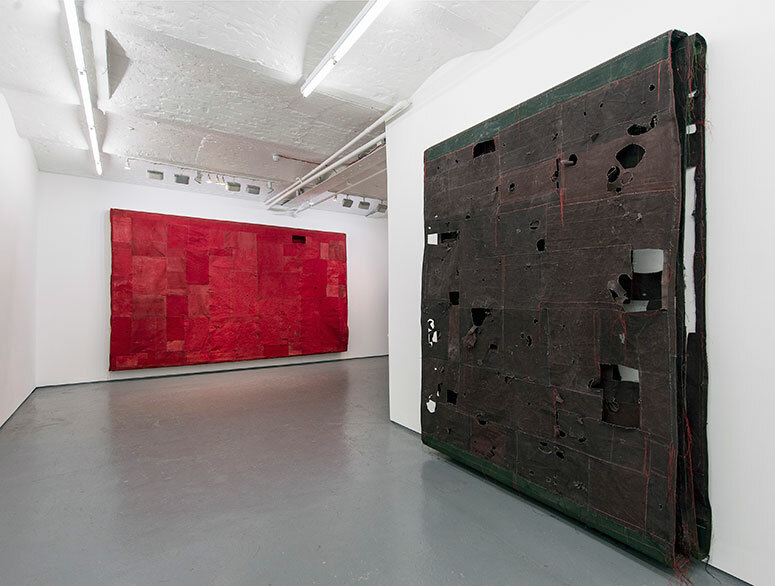 Simon Callery: My paintings don’t express ideas. They are made to be experienced. Some of my ideas for painting form in the landscape and in my ongoing work with archaeology. Others spring from studio experimentation and from how we respond to materials. As a painter – it might seem an obscure thing to say – but I have learnt that if we place too much emphasis on the visual aspects of things we diminish our experience and our knowledge. My paintings involve the body as much as the eye. Painting has been instrumental in the development of image making in Western culture. I think this puts it in a good position to critique our current obsession with image. MW: How do you decide what your next artwork will be and how do you know when it is finished? SC: Each painting tends to give birth to the next painting. Half way through a work I start the next one. They grow into a family of works, which are related in various ways – sometimes through opposition as much as similarity. Some survive the studio and some don’t. They are finished when I can’t see faults. Although individual works get finished the questions that drive them don’t – they evolve and accumulate. MW: How has it been working with FOLD? SC: The programme this year at the new space in New Cavendish Street has been really exciting and strong. I am looking forward to the next show by leading Danish artist Ellen Hyllemose very much. There are a number of common features – in particular a stress on materiality – that are emerging in the work of the artists of different generations and geographies working with FOLD. This seems healthy, ideas cross-fertilize, it binds the artists, and reveals what is rising in new art. SC: My current show at FOLD is called Flat Paintings. I am suggesting that one of the defining characteristics of painting is now one of many characteristics in contemporary painting. I started these works when I took rolls of washed canvas on site to the Institute of Archaeology, University of Oxford excavations at Moel y Gaer in North Wales in 2014 – 2015. I had been looking for a way to puncture the surface of my paintings. Working directly off the material surfaces of the archaeological trenches provided me with the right opportunity. These works have internal voids and spatial relationships as significant as the flat front surface. I have also included a large-scale work called Wallspine (Leaf) 2015, which was made with the help of fine art students from Nottingham Trent University in April this year. This single work is made from 125 metres of canvas. I think the works have reached an important point. They do not cling onto representation in a conventional image based manner any more – they represent themselves. As a result their relationship with the viewer is direct and unmediated. MW: You call your artworks paintings but you don’t use paint, why have you decided to ‘paint’ in such a way? SC: I call my artworks paintings because I am a painter and everything I make is within the context of painting. I use a huge amount of paint although like all the aspects of the new work I am looking for new roles for the materials. The paint I am currently working with is distemper – which is rabbit skin glue size and dry pigments mixed – it is soaked into the fabric of the canvas when it is hot. By rethinking and recasting the functions of the materials I hope to find new functions for painting and new experiences for viewers. Painting must continue, as it always has done, to recast itself in order to remain important as a medium. SC: I am looking for opportunities to do a show where I can put a number of my large-scale works together with more intimate small-scale paintings. I have a sense that as a group a new story will emerge.